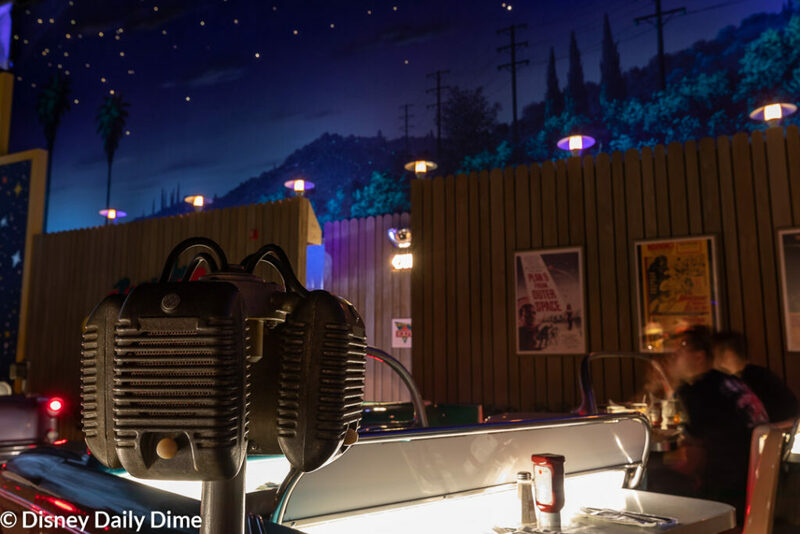 On a recent trip, we made our way over to the Sci-Fi Dine-In Theater Restaurant in Hollywood Studios. We have wanted to dine here for a while and finally took the plunge. Not just because we needed to do a Sci-Fi Dine-In Theater Restaurant review, but because the theme and atmosphere always sounded intriguing. I have a couple of faint memories growing up and going to a drive-in movie theater. I couldn’t tell you what we watched, but I do remember it was a good time. At Sci-Fi you’ll find a plethora of regular American style meals such as hamburgers, sandwiches, and barbecue to name a few. What we were really surprised by was the diversity of some of the not so traditional food. Items like the vegetarian falafel burger and the tofu lettuce wraps signal that this isn’t your regular burger and fries restaurant. But I’m getting a little ahead of myself. Here in our Sci-Fi Dine-In Theater Restaurant review, we’ll cover all things of interest to the restaurant. The atmosphere, setting, service and food are all on our menu for this post. We’ll of course have pictures to accompany it all. Sci-Fi Dine-In Theater Restaurant is a one table service credit meal on the Disney Dining plan. Most entrees will cost you between $15 and $25, which means it is not the best value for your table service credit. For that reason, it will likely make sense to pay out of pocket here. One quick note for this review, we had some family friends and their kids with us for this meal. We have a few pictures of their entrees and got their feedback and thoughts about this meal. 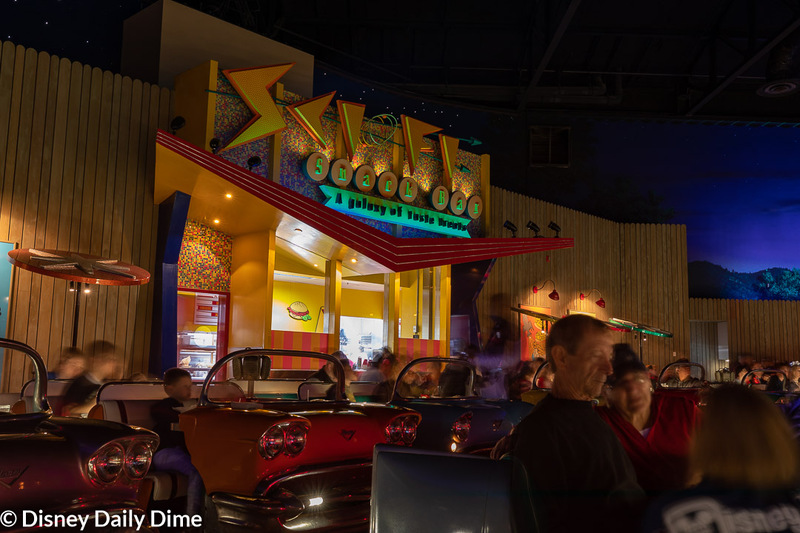 As it may or may not be clear from the name, the Sci-Fi Dine-In Theater Restaurant is themed to resemble a 1950s era drive-in. However, there’s an interesting little twist that comes with this. Rather than this theater showing some random movie clips or made up Disney films while you dine, you get to watch real hokey sci-fi B movies of days gone by. Yes, real legit movies of yesteryear in Hollywood! We actually also got to watch a little bit of Tom and Jerry while eating. Not sure how that fits the Sci-Fi part of the theme, but the kids enjoyed it. The somewhat odd part of the theme to me is that the whole setup is meant to be held within a Hollywood Studio Soundstage. As you walk into the building and wait for your reservation, you’ll notice that behind the host stand is a giant wooden façade. This helps represent the working stage that houses the drive-in. The whole drive-in is essentially a set piece. So it’s a sound stage for filming a movie, set up to look like a drive-in movie theater, showing classic old Sci-Fi. Just typing that, I feel like I stepped into the movie Inception. It feels a little over thought to me, but hey I still liked it. Just simplify it and call it a drive-in movie theater. And yes, I know it is meant to invoke the working studio roots of Hollywood Studios. I just feel it could be simplified. 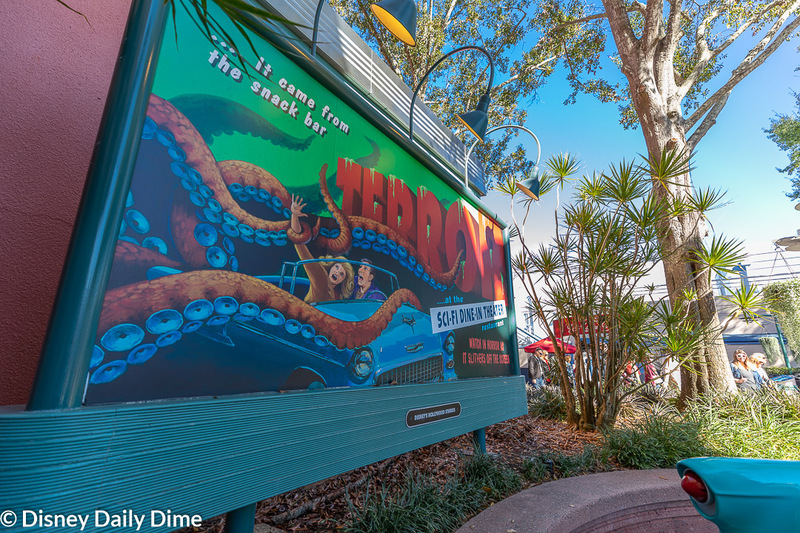 In addition, you’ll find all sorts of kitschy vintage memorabilia at the entrance, like this sign for Attack of the 50 Ft Woman. Make sure you take time to walk around the entrance area and look at all of the different memorabilia hung on the walls. There are some really interesting things here to observe, but we won’t spoil it. Oh, make sure you get your picture in the car right in front of the entrance. Beyond my slightly tired head of the theme within a theme, the main drive-in theater setup worked wonderfully. You’ll watch all your B-movies from a faux classic styled car. The cars are appropriately themed to the era, with tail fins and all. The cars are shrunk so you can have adequate seating for the restaurant, but they work wonderfully. But don’t just take in the silver screen happenings. Look around. They went through great lengths to build out the feeling of eating at a real drive in. Fencing to keep out onlookers, stars in the sky, and sound boxes are just a few of some well-done details. Sci-Fi Dine-In Theater Restaurant works unbelievably well bringing a nighttime atmosphere to the restaurant. One thing to note on the seating. If you want your group to be able to all sit together in a more normal seating set up, there are picnic tables and small two tops at the back of the drive-in. All in all, the atmosphere here really is top notch. Is it sort of kitschy? Sure, but that makes it great. Having this excellent theme helps remove any feeling that you are having some sort of super charged counter service meal. For our meal at Sci-Fi Dine-In Theater Restaurant we only got one appetizer. Before I get to the actual appetizer itself, I did want to point out one thing. The seating setup with the cars actually makes it difficult to share food. Especially if you have people scattered across two cars like we did. In this case, it resulted in me eating most of the appetizer we ordered. The appetizer we ordered was the shrimp and crab fondue. 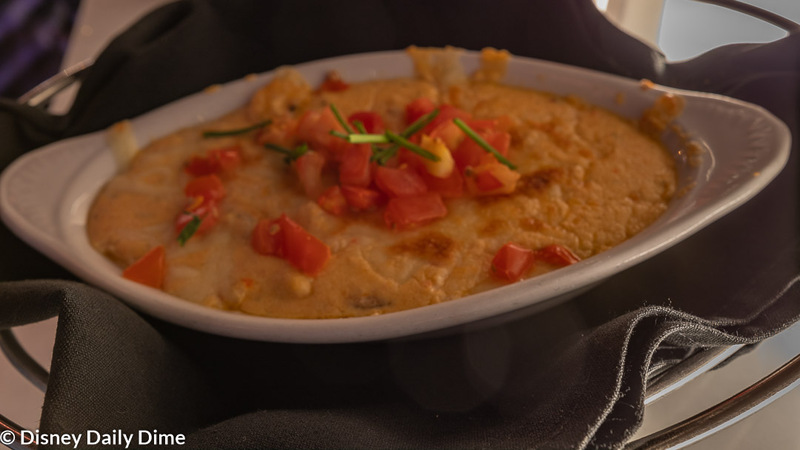 It was solid shrimp and crab dip for sure, but not anything that blew me away. Although I will say that for $10, the price/value ratio was right in line. There were good sized bits of crab and shrimp in here, unlike the lobster in my lobster bisque over at Coral Reef Restaurant. If I had one minor issue, I was expecting the dip to be a bit thicker than it was, since they called it a fondue. Not a big thing, but just unexpected. You know how I just mentioned that sharing wasn’t very easy with the car seating configuration? That too would be true of having people pass me their meals so I can take pictures of them. For this particular meal, the kids decided they were not overly interested in me taking 5 minutes to photograph their food. They were hungry. Correction, at this point in the day I think they were actually hangry! Unfortunately, that means I don’t have any pictures of the kid’s food to show you, but we can tell you about it. The good thing is, all four kids all got the same thing to eat. Every last one of them…don’t they know we need variety for the blog!? Oh well, I’ve given up on making that point. The kids all had the macaroni & cheese. While I didn’t get to try it, much less see it, the kids all said they really liked it. This was evidenced by the fact that there was nothing left when they finished up. 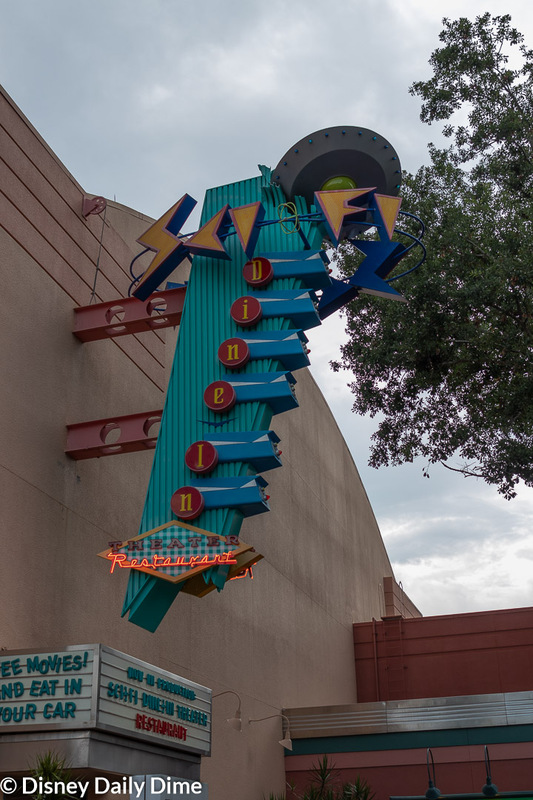 We have read quite a bit about the food at Sci-Fi Dine-In Theater restaurant and know that the experiences with food appear to be all over the map. I have to say we were all pleased with what we had. I don’t think we would call it particularly amazing food, but a solid table service caliber meal for Hollywood Studios. The food is certainly a higher quality than what you will find at most counter service restaurants in the Disney World parks. 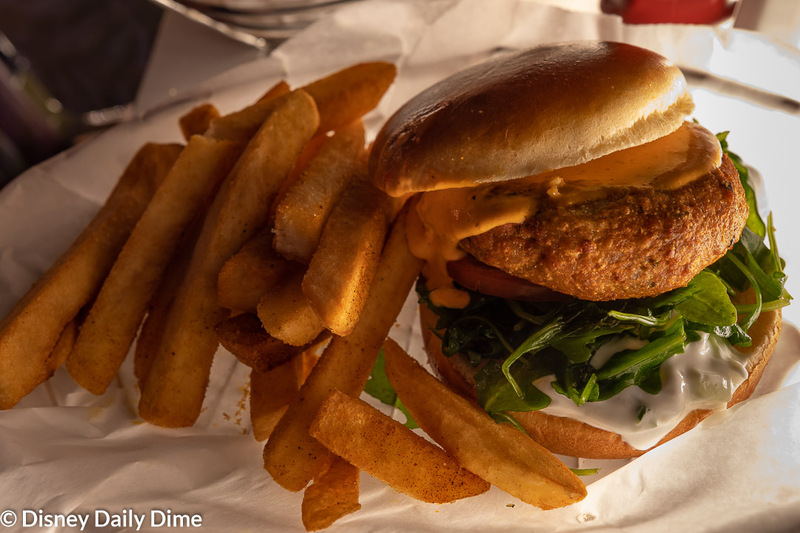 For the first entrée, one of our friends ordered the vegetarian falafel burger. She found it to have good flavors however, she did note that the texture was a little too mushy. 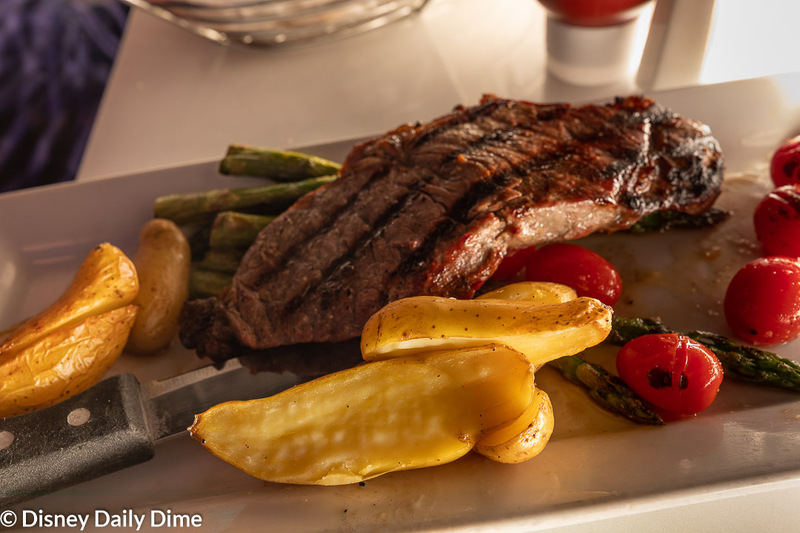 Our other friend ordered the flame-broiled New York strip steak. He found it to be a solid steak, but nothing more than that. You can see in the picture it’s juicy and well done. The real problem with the steak is that it costs $33, which might be a bit pricey for a steak considered just solid. You’ll have to make that choice for yourself. Next up, I wanted to have something a little lighter. That was especially good considering I ate most of the shrimp and crab fondue myself. 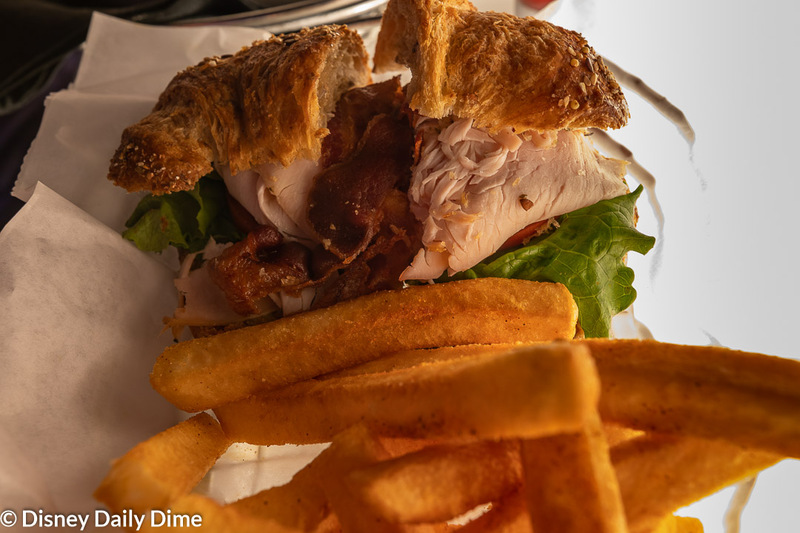 My order of the oven-roasted turkey sandwich was just what the doctor ordered. The croissant was light and fluffy, just like you would want it. The turkey was honestly a bit bland, but that was okay because the cilantro-avocado aioli was what made the sandwich for me. It was unexpectedly good actually. Now, avocado and cilantro are two of my favorite flavor profiles, so that may make me biased but it was like a meal made just for me. I found the fries to be a nice well-matched side for the sandwich. They were crunchy on the outside, but soft on the inside, just the way I like it. I wouldn’t quite call them steak fries, but they were thicker than your average McDonald’s type fries. They had a seasoning salt sprinkled on them, which added another layer of flavor. For the last entrée, Carla was on the hunt for a gluten free dish. She ultimately ordered the gluten free oven roasted turkey wrap. Carla was please because it provided a nice light option. She enjoyed the wrap, but wished there was more of the cilantro-avocado aioli on it. Carla was relatively pleased with the quality of the tortilla, considering it was gluten free. The adults did not get any desserts here, but we do have one point of reference for the kids. They actually ordered a milk shake as part of their meal/dessert. Our waitress was nice enough to take the milk shake and split it into multiple cups so the kids could share. I don’t think I’ve ever seen a server at Disney World do that for us. Kudos to the Sci-Fi Dine-In Theater team for being the first. The girls loved the milk shake and wished they could have another one. Sorry for the lack of a picture as the girls sucked it down before I could get to it. 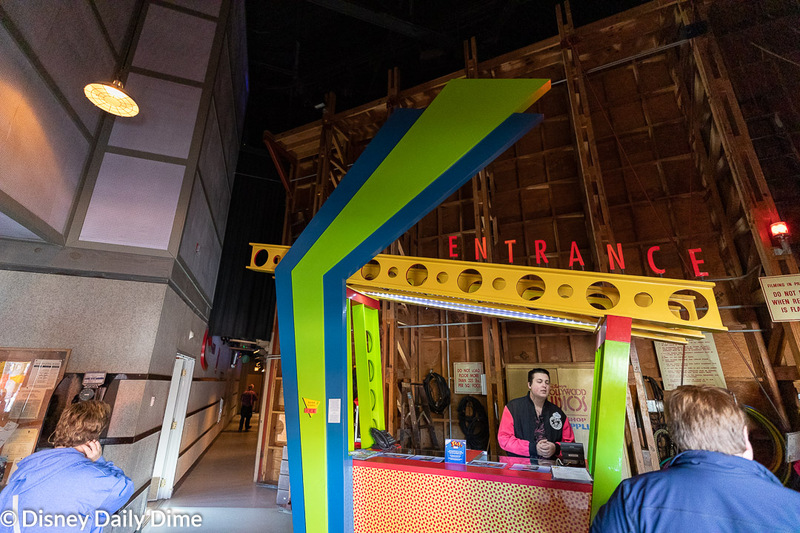 Overall, we were really happy with our visit to the Sci-Fi Dine-In Theater Restaurant. The atmosphere was definitely the standout to us, but the food was pleasing too. As far as atmosphere goes, it was more fun that I could have imagined. Yes, it has the weird theme within theme thing, but that will probably not be noticeable for 80% of guests. It really isn’t that big of a deal. The kids in our group all loved it there. I think they particularly enjoyed being able to dine without mom and dad being right on top of them. Getting to watch movies while eating was just a plus. The kids were all engrossed in the movies which gave the adults a very relaxed meal. For that reason alone, we will be back!!! For food, it’s definitely a higher level than the standard counter service fair. 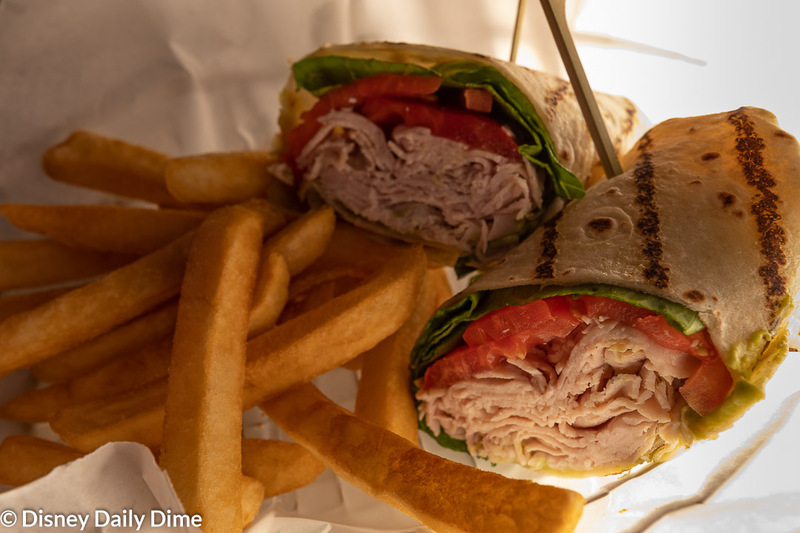 The menu is diverse and presents some unique options that give you more choices than just burgers and fries. That all comes with a very modest premium in cost over the aforementioned counter service restaurants, especially for similar level quality food. For example, I wouldn’t compare their hamburgers to that of the typical Disney World counter service hockey puck hamburgers. That’s apples and oranges, as far as I’m concerned. For the pricing of the entrees and quality, we actually found good value here. When you consider the theme, price point and food quality Sci-Fi Dine-In Theater Restaurant is a place we will be going back to again. With that, we’ll wrap up our Sci-Fi Dine-In Theater Restaurant review. It’s a great table service option over in Hollywood Studios. While the theme is certainly front and center, the food it no slouch. If you want a taste of a time gone by, this is a wonderful restaurant to stop by. 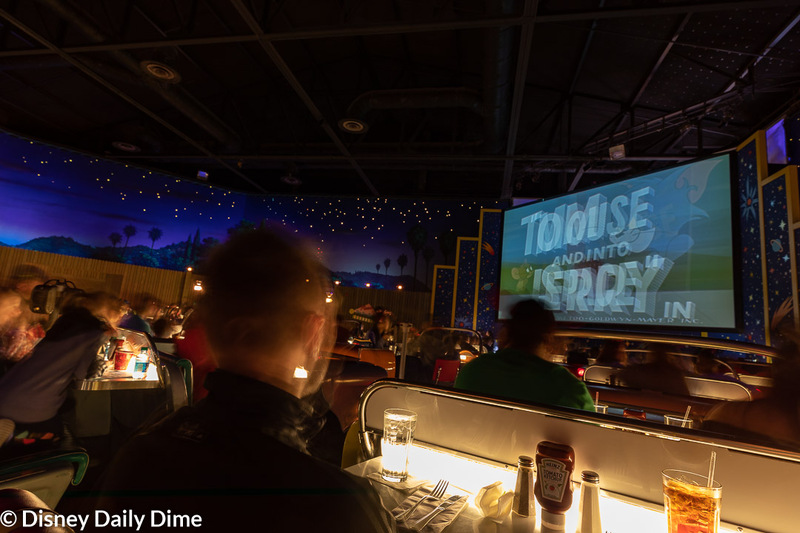 If our Sci-Fi Dine-In Theater Restaurant review was helpful, or at least entertaining, please like and share this with your friends or anyone you think will find it useful. Just use the sharing buttons on the page. We always appreciate it when you share our posts, as it allows us to spread the word about our young blog and hopefully allows us to help others.